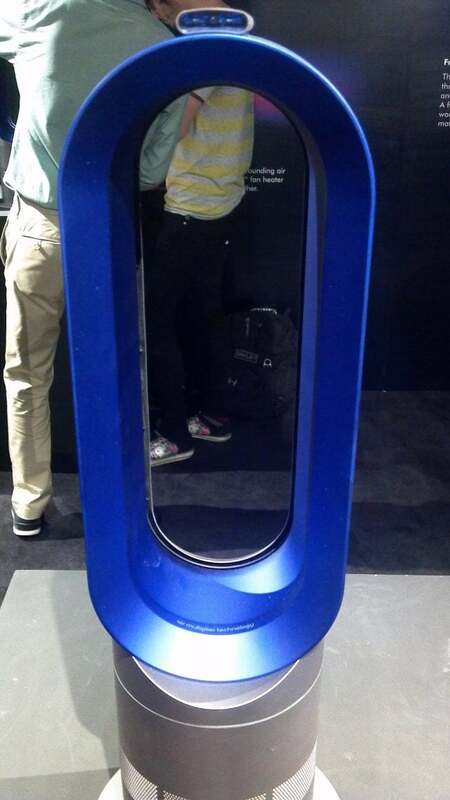 I had the great pleasure of attending the new product launch event for Dyson in NYC. The event was held in a very chic, converted warehouse on the far west side of Manhattan. The minimalist space played well with the minimalistic, sleek design of the Dyson products. While I do think that the Dyson products are very attractive on their own, the overall presentation made them look even more impressive. It was very smartly, artfully done. It reflected well on the brand itself. We had some time to look around and try out the new products while we were treated to some very tasty and surprisingly unique hors d’oeuvres and drinks. The event featured virtually the entire Dyson line of products including handheld, slim, and famous “ball” vacuums as well as the very cool blade-less air multiplier fans. All of the products seemed to work as well as they looked, which is pretty good. About 30 minutes past and Mr. James Dyson, the main inventor and company founder, offered a presentation. He spoke about the finer points of the products and how features and usability are always being improved. Better design, sleeker looks, lighter weight, easier use, yet with more power was the main message here. Like with electronics, there seems to be a continuous drive to improve and push the status quo. All of the products saw a number of important improvements. Then, we arrived at the main part of the presentation…the introduction of the Dyson Hot air multiplying heater. This was very impressive. Great looks as always, but also quite functional. The heater featured a cool-to-the-touch surface while pumping up what Mr. Dyson claims as 6 times the heating power of a traditional heater. The fan heater projects heat further, heating the whole room faster than any other. It is also constantly recirculating the room’s air, so the Hot will maintain precise temperature control. As with the cooling fans, there are no fast-spinning blades or visible heating elements, so it is easy to clean. There is also an automatic cut out that switches off the heating plates if the unit is tipped over. The unit will be out in stores soon and will retail for $399, which seems to be a fair price given the quality and performance of the product. The only thing missing…where was my favorite Dyson invention of all time??? The Air Blade! Well, while it was sadly not out on display (man, I would be so dry if it was), they did install it in the bathrooms for all the enjoy. Now that was a relief.